Birthday Status For Son : The birthday of your son is one of the most favorite day’s of your life when you first laid your eyes on his cute adorable face. It’s a charming feeling of satisfaction and a great matter of your pride. 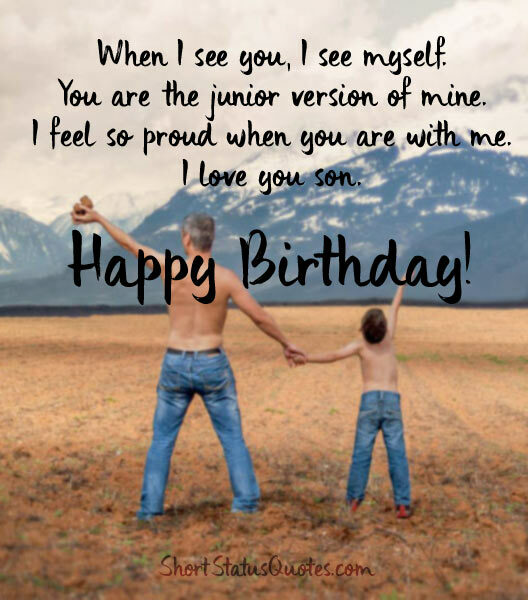 To celebrate your son’s birthday right here we have put lots of Best Birthday Status For Son, Happy Birthday Wishes and Messages For Son and Short B’day Quotes from various reliable source. 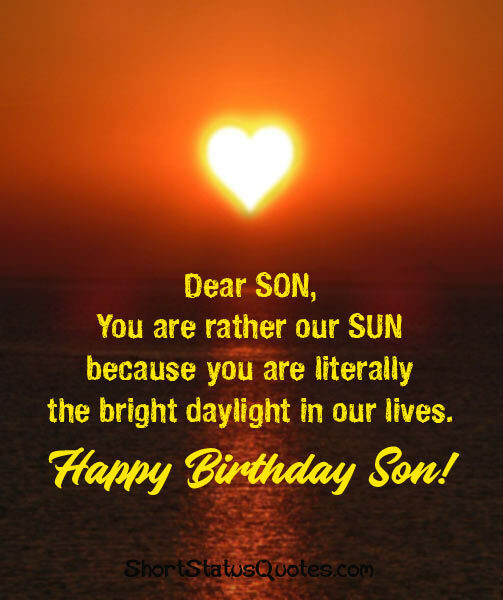 This is exactly what to say to a son on his birthday from father or mom. Our compilation of birthday status for son will help you to say happy birthday son with love. Take a look through our collection and choose the best birthday status for son to wish him as a proud parents! Dear Son, neither is your dad a KING nor am I a QUEEN. But you are our loving PRINCE. Happy Birthday to the best Son ever! We hope you fulfill all your dreams and surge ahead in the direction of success. Happy birthday my dear son. A mother’s love is unconditional my son. No one can love you as I love you. I scolded you, annoyed you. But remember that I love you the most. Happy B’day! You changed the world as soon as you entered in my life. Time flies so fast you have become a lot stronger and bigger but you will always be my baby. The most precious memories and the happiest moments of my life revolve around the smiles and laughs of just one person – my son. Happy birthday. Dear son, you are our life’s most awesome home run. Happy birthdays. You are not just a son to me. You’re my life, my soul, my heart and most of all, the reason for my existence. Happy B’day! Son… you make every single day of my life feel like Mother’s Day. Happy birthday. Son… all the ups and downs in my life were written off and forgotten, on the day you were born. My son, you are the hero of mine. I was waiting for seeing you celebrate your happiest day. I’m a proud mother of an amazing son. Always smile like this. You have a way of making Each day a special one That’s why you’re wished a birthday Filled with lots of love, dear Son. As your parents, sometimes, we can’t help but cry. Sometimes, we can’t believe it’s true, that we have a son as perfect as you. Happy Birthday! We love you. Dear son, you are like a prince to us. May you have a great year and glorious life ahead. We are always with you. I wish you a very Happy Birthday. The only topic on which your mother and I have fought endlessly is deciding on who loves you more – and we are still fighting because both of us adore you from the core of our hearts. Happy birthday son. We can’t help but pat ourselves on the back for raising such a fine young man. You are not just awesome, you are our awe-son. Son, spread your wings and live life to the fullest because I’m going to live mine through your eyes. I love you. When I see you, I see myself. You are the junior version of mine. I feel so proud when you are with me. I love you son. Enjoy your big day! Every father secretly wishes that his son grows taller and wiser than him. Congratulations – at least you’ve grown taller. Happy birthday. We always thought that miracles happened to one in a billion. We never imagined that we would be the lucky chosen ones until we had you as our dear son. Happy birthday. Before you were born we could never imagine our lives as parents. Now we can never imagine living our lives without being parents to a son as adorable as you. Happy birthday. My sweet son, blessings to you on your special day and every day. Happy Birthday. May your blessings be big, Your worries are small and your life filled with as much joy as you have brought to mine. Happy Birthday! They say to make a wish when you blow out the candles, may all your wishes come true on your special day! Happy Bday! In the world over, only very few parents are privileged to be blessed with a gifted son like you. We are proud of you, son. Best wishes on your birthday! A wonderful person, always has a wonderful life. And, so shall you. We are always there for you, my Son. Wish you a very happy and sweet birthday. We asked God to give us a son who grows up to become hard working, honest and successful. You are proof that God is alive. I would give up anything in my life to give you everything that you need to put a smile on your face. Happy Birthday Son! I love you! Maybe you haven’t got the best parent in me, but I must say you have proved to be the best son in the world. I Love You, my son. We would go through trials and tribulations just to put a smile on your face. We love you more than we can ever express in words. Never forget that, son. You are the apple of our eye and our biggest bundle of happiness. You make us so happy and proud every day with all the things you do. Happy Birthday, dear son. Son, you outgrew my lap, but never my heart. Happy Birthday! Your mom and I love you like there is no tomorrow, because your love frees us from grief and sorrow. I will forever be proud that you are my son, happy birthday my dear son! Happy birthday to the best son that any parent could ask to have! No love is greater than that of a father for His son. Happy Bday! The best gifts in the world are not always wrapped in boxes. They also come in the form of loving sons like you. You Are my little star which will become to the galaxy. Happy Birthday to my son. Happy Birthday to our bundle of joy who has grown up to be our proud son! No matter how many of your birthdays come and go, you will always be my little kid. Happy birthday! May God give everyone a Son like you. We feel blessed to have a son like you. God gave you to us at a very special moment. We feel so blessed to be your parents. Happy birthday. 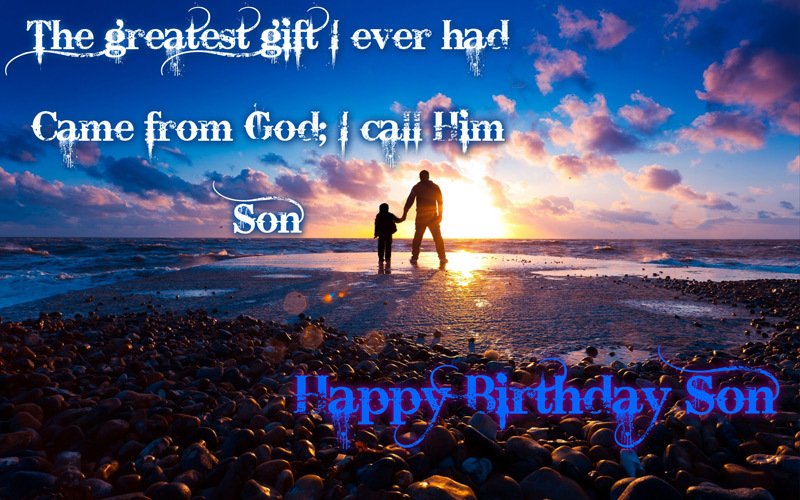 Hope you have got the Best Happy Birthday Status For Son, Short B’day Quotes, Wishes and Messages to celebrate your birthday boy’s most enjoyable moment of life! If he is so little to read this you may write down B’day Wishes for Son on a cute card and preserve it to give him when he will be able to read it, then it will be a way to cherish his childhood memories!